It feels like we haven’t heard from the Wrenchmonkees for a while. 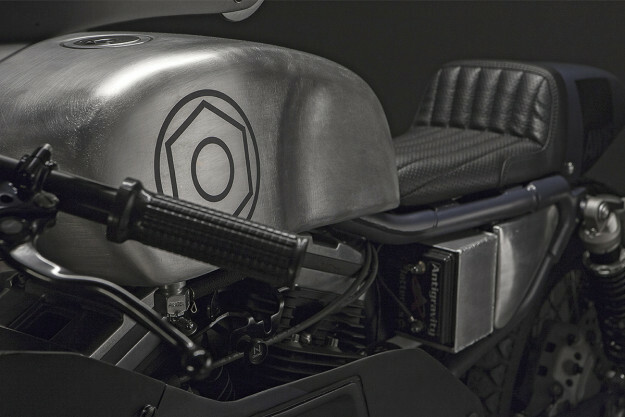 And we’ve just found out why: the original alt-moto superstar builders have changed the way they’re doing business. It’s right up there with the best from the Danish workshop, and justifies the return to high-end building: “We had no fun building bikes on a budget just to pay the rent,” says Nicholas. 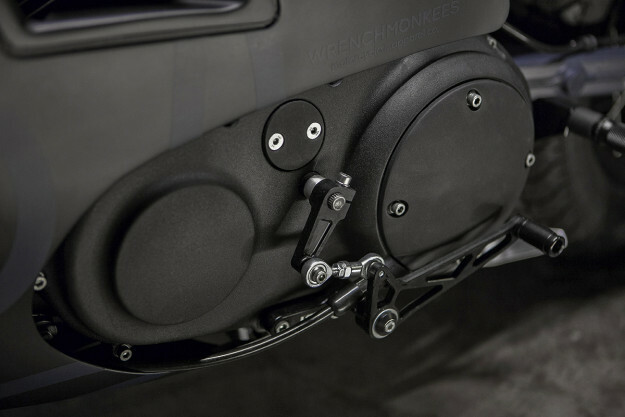 As well as the ‘less is more’ approach, the Wrenchmonkees are increasing the emphasis on the parts and clothing side of the operation. 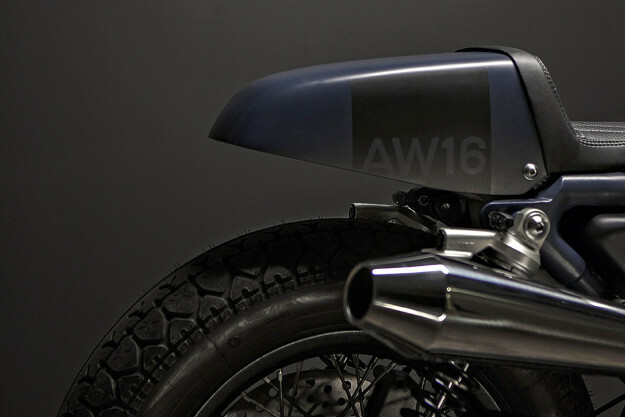 (Hence the ‘AW16’ name for this bike.) And they’re working more with manufacturers—as they’ve done with a Yamaha XJ1300 for the Yard Built project. AW16 is has the signature Wrenchmonkees vibe—times ten. 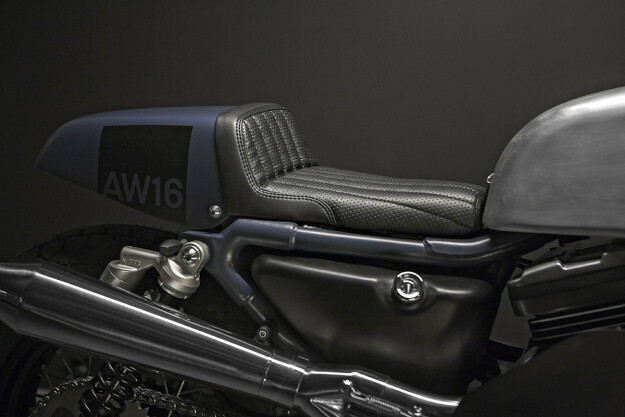 They’ve defined their style as ‘wrenched from black,’ and this new custom has that familiar yet edgy core of darkness. The base bike is a 2001-spec Sportster 883. Sitting on top of the modified frame is a Storz Road Race aluminum tank, with a high-flow Pingel petcock handling fuel supply. 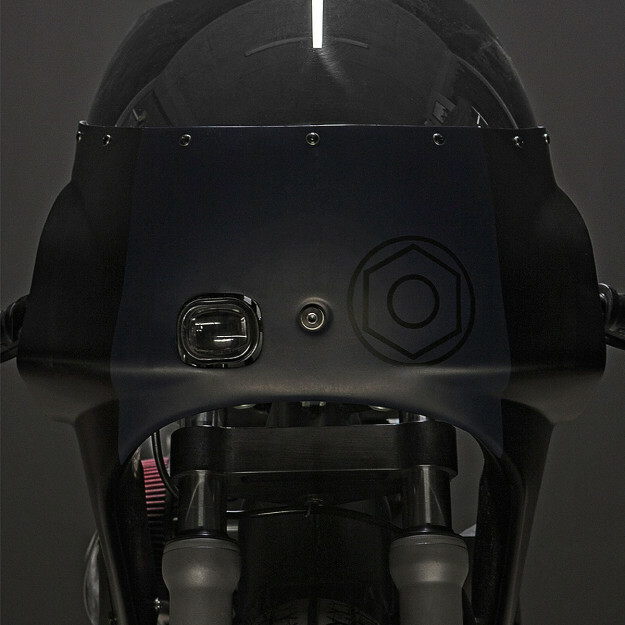 The rest of the bodywork has been custom-built in house, from the seat and tail unit to the side covers—and the discreet inner fender that keeps crud away from the back of the engine. 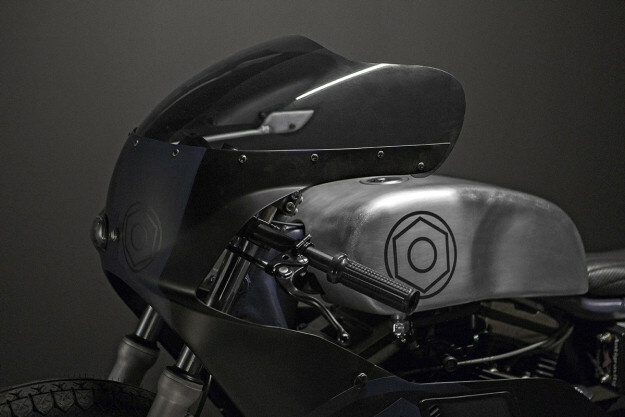 The fairing is fiberglass and modeled on the style of the classic Yamaha TZ race fairings. The headlight is an ellipsoid reflector spotlight—much brighter and more compact than usual. The turn signals and taillight come from the German brand Highsider. They’re probably the smallest Euro-approved lights you can legally install. The engine internals are unmodified, but there’s a K&N air filter and one of the best exhaust systems we’ve ever seen on a Harley, a slightly modified ‘Bossley Reventon’ from the Japanese company Easyriders. The belt drive is gone, replaced by a ThreeD chain hooked up to an aluminum rear sprocket. There’s also a Power Clutch to reduce the force required at the lever. The forks have been modified with a Progressive Suspension lowering kit, including progressive rate springs for a smoother ride. The tubes are held in place by massive Chainsickle CNC’d aluminum triple clamps, and there’s a matching set of clip-ons from Joker Machine, anodized in black. The levers are from the Italian specialist Grimeca, plumbed into steel braided hoses. The brake system has been upgraded with Russell full floating rotors. 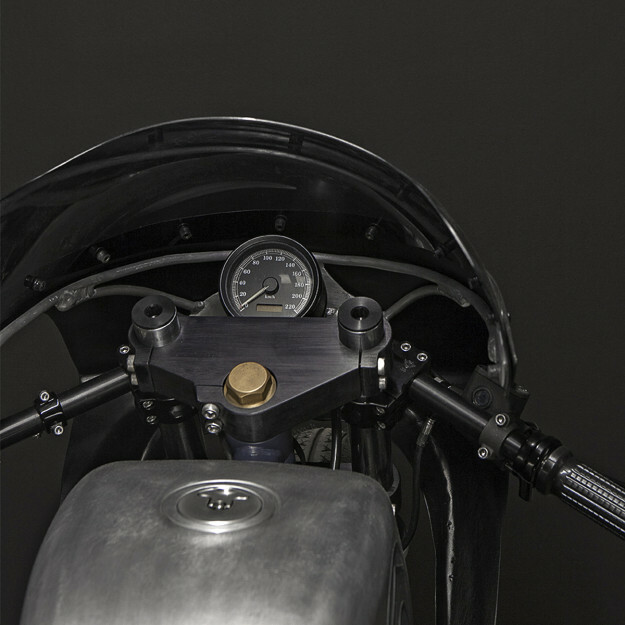 To avoid the monkey-on-a-motorcycle look that so many café’d Sportsters have, this one has LSL rearsets—made from high tensile, anodized billet aluminum. It’s all very low-key and perfectly judged, and that extends to the wheels. The aluminum rims and hubs are powder coated, and the size has dropped down an inch at the front to 18 inches. 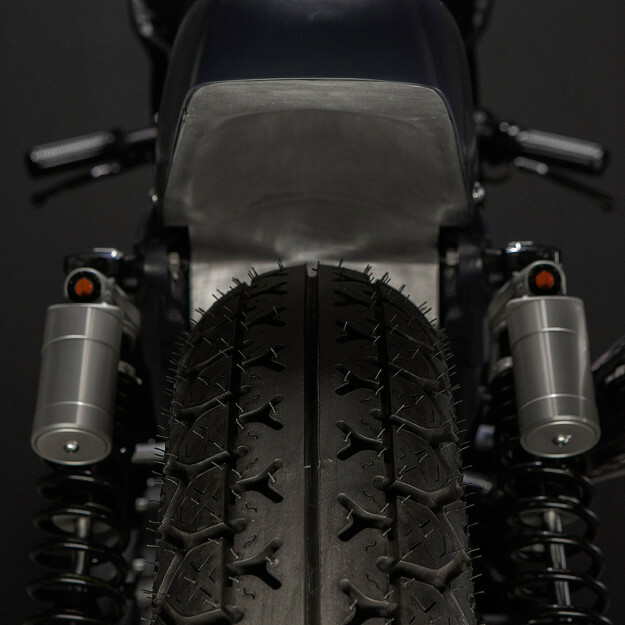 The rear keeps the standard 16-inch Sportster size. The tires are Continental’s rare K112 pattern, with a longitudinal tread modeled after 70s superbike tires—but a modern compound rubber. 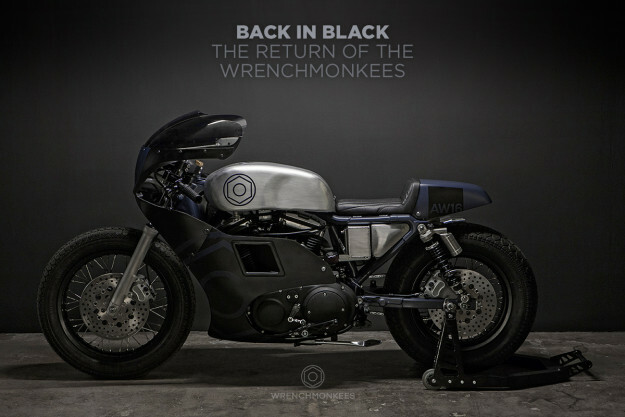 It’s great to see the Wrenchmonkees still firing hard on all cylinders, after eight years in the business. And if you can’t put one of their machines in your garage, keep an eye out for the new clothing range. 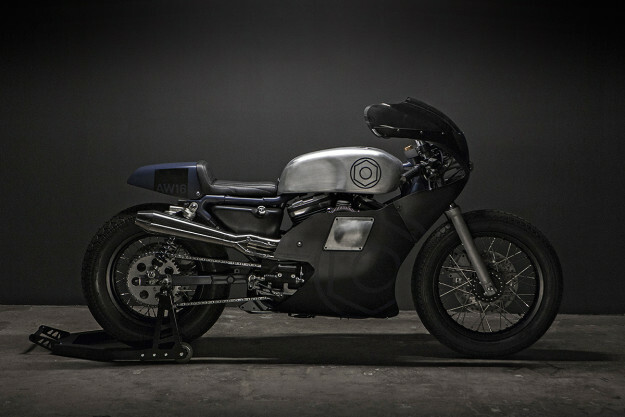 Like the bikes, it’ll be dark, functional, and subtly stylish. Here’s to the next eight years, Per and Nicholas. Skål!